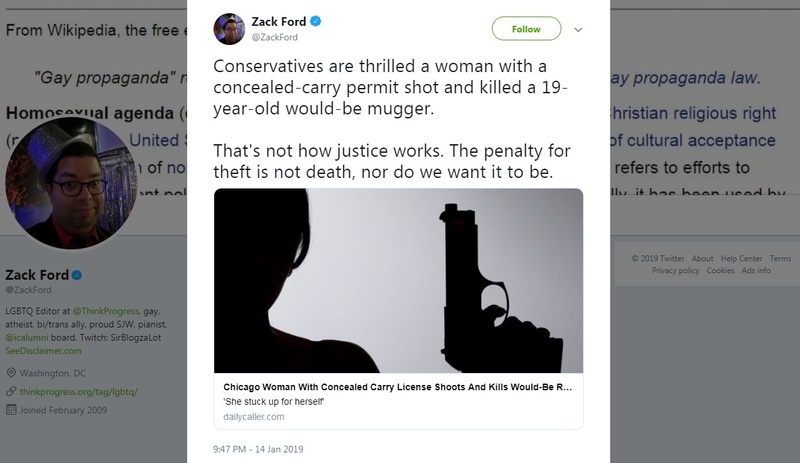 ThinkProgress "LGBTQ Editor" Zack Ford deleted a tweet on Tuesday where he slammed conservatives for being "thrilled" that an innocent woman shot and killed a 19-year-old armed mugger in Chicago. "Conservatives are thrilled a woman with a concealed-carry permit shot and killed a 19-year-old would-be mugger," Ford tweeted Monday. "That's not how justice works. The penalty for theft is not death, nor do we want it to be." "The kid was 19!" Ford said in another tweet after getting pushback. "I just feel like we're being way too disposable with his life. A gun death is a gun death, and the fact she was about to protect herself in no way motivates me to change my belief that she should not have had a gun in the first place." [...]The teen had a record of arrests, mostly for drug charges. 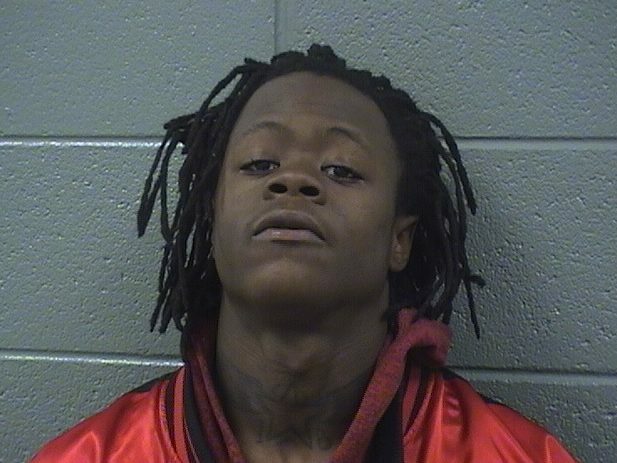 But last June, he was charged with attacking a sergeant and a police officer after he and his father were arrested during a narcotics raid in Englewood where the father lived, according to court records. Police were executing a search warrant on June 8 when they found two zip-lock bags, one pink and one clear, both containing "numerous tan chunks of suspect heroin," according to a police report. They also found a pill bottle filled with what they believed was liquid codeine. [...]Goings was charged with six counts of aggravated battery to a peace officer but they were dropped in October after the teen pleaded guilty to a drug charge. He was given probation and released from jail in early November, just days before his 19th birthday. Translation: a leftist judge let him off to "fight systemic racism." In Ford's dream world, Laavion should have gotten another slap on the wrist and be let back out on the streets.